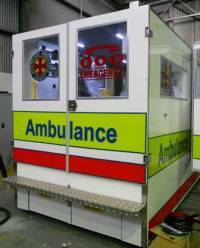 /// Mader has manufactured a wide range of custom special vehicles for Australian and international clients. 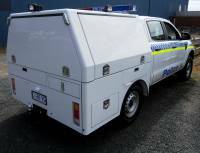 We can manufacture just about anything on any base vehicle. Mader also specialises in vehicle retro-fit programs, where useable components are removed from old vehicles and fitted into new vehicles along with adding the latest inovations and improvements. These components include but are not limited to, Lightbars, Internal cabinetry, Seating and Electrical Systems. This program works effectively with all forms of Ambulances, Staff / First response and Emergency vehicles. A fully insulated, water proof van compartment can be fabricated to transport perishable food goods with the provision of various floor media to suit the customers requirements. The compartment can be air conditioned if required. Catering to the modern needs of law enforcement, Mader has been contracted to fabricate a number of justice processing units. Secure storage of loose objects is paramount whilst in transit. The potential for this equipment to become a projectile is greatly decreased when safely stowed. Storage Shelving, Oxygen Cylinder Restraints, Storage Netting Restraints and Cargo Screens are just some of the securement methods available. Our team at Mader can supply and fit components to suit your particular requirements in the shortest possible time frame. Safety is paramount in the mining industry and Mader has manufactured a number of Mercedes 4x4 support vehicles, with the ability to remotely control heavy machinery in an underground mine enviroment, whilst situated kilometers away and out of danger. Mobile Hospital, Mobile Diagnostic Unit, Mobile Dental Unit. Transporting of prisoners in a safe, comfortable, monitored and segregated enviroment is a prime concern for all involved in this process. Mader manufacture a variety of vehicles that meet these specific requirements. A variety of promotional or Training environments can be designed and fabricated by Mader to suit our customers specific requirements. 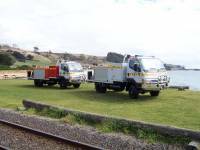 A wide variety of base vehicles are used in the Rescue vehicle catagories ranging from trucks to utes to flat trays. Mader's clients include Fire Rescue, Road Accident, Rescue SES. Mader also specialises in vehicle retro-fit programs, where useable components are removed from old vehicles and fitted into new vehicles along with adding the latest innovations and improvements. These components include but are not limited to, Lightbars, Internal cabinetry, Seating and Electrical Systems. This program works effectively with all forms of Ambulances, Staff / First response and Emergency vehicles. Mader's Special Vehicle section can fabricate a vehicle to suit your needs. From Mobile Diagnostic Units to mobile offices, coffee vans, promotional vehicles, training simulators and Mini Moke patient transport, Mader will design, develop and fabricate the transport that you require.